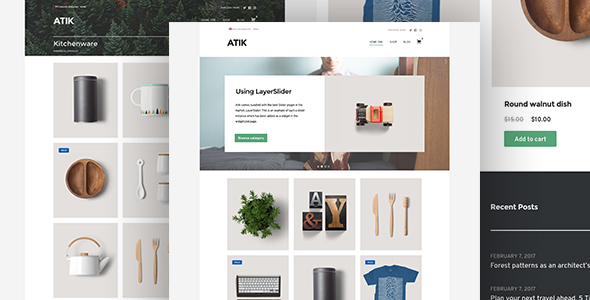 Atik – A Simple WordPress Theme for your Online Store Created by Codestag. This templates have specific characteristics, namely: Atik is an easy to setup and manage WooCommerce theme that brings layout flexibility with solid, consistent design and layout. Wether you sell only one, or hundreds of products, with Atik you will find a modular design system that works out of the box, and rock solid code that is developer friendly . You can use this Atik – A Simple WordPress Theme for your Online Store on WordPress category for clean, codestag, customizer, ecommerce, layerslider, minimal, modern, responsive, shop, simple, store, whitespace, widgetized, woocommerce and another uses. Atik is an easy to setup and manage WooCommerce theme that brings layout flexibility with solid, consistent design and layout. Wether you sell only one, or hundreds of products, with Atik you will find a modular design system that works out of the box, and rock solid code that is developer friendly and following the best WordPress coding practices. Say goodbye to endless setup hours and meaningless demo imports. Atik provides flexible customization options under the Customizer panel that let you configure strategic layout options in a non-obtrusive and intuitive flow. Shop Layout Define columns (sidebar option is included), product grid style, add an optional header image to your category pages and more. Typography Choose any font from the Google Web Fonts directory for your titles and body text. Content widgets Create your homepage layout by combining 6 custom widgets that give you complete flexibility on where and how to display your content. Section: Feature Callout Adds a simple text-image layout that can be aligned in any way you wish. You can use this to showcase important aspects of your services / store in clear way. Section: Blog Posts It will simply output a section that displays your posts, in the layout that you define.. Section: Category Boxes It will simply output a section that displays your posts, in one of the provided layouts. Section: Featured slides A simple slider solution for users who want to more fast paced workflows. Atik does not come with a page builder and endless customization options. Nor it requires a huge list of plugins in order to work like the demo. Atik’s thoughtful design decisions allow you to set up and manage a WooCommerce-based store that will you actually enjoy. Atik lets you add a custom intro section to your homepage by adding a header image or a video. Works with .mp4 videos and youTube links. Over that media you can also add a title and a description (html markup is supported) as a welcome message to your visitors. StagTools Compatible (free): Adds shortcodes, custom widgets and post types to your theme. For more info check the plugin page. Made by Elite Authors standing behind their product. The latest updates and bug fixes for this theme can be seen inside the theme files in a file called “changelog.txt” or you can also view the online changelog.